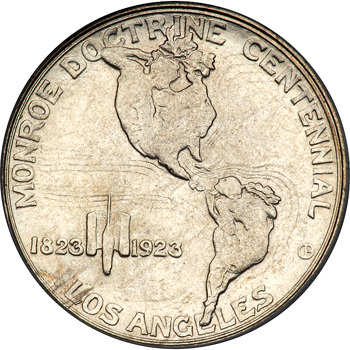 One of the coins with the most convoluted history is the 1923-S Monroe Doctrine Centennial Half Dollar. Certainly, the Monroe Doctrine itself is deserving of national recognition. This foreign policy statement issued by President James Monroe in 1823 expressed in no uncertain terms that the U.S. would not tolerate European interference, control or influence in North and South America. However, the way the coin came about is odd to say the least. In the early 1920’s, Hollywood was reeling from multiple scandals. To help polish the studios’ tarnished reputations, the American Historical Revue and Motion Picture Historical Exposition was formed. While searching for a way to raise funds, the Historical Exposition decided that a commemorative coin would do the trick, as well as have the additional benefit of generating much needed goodwill for the film industry. 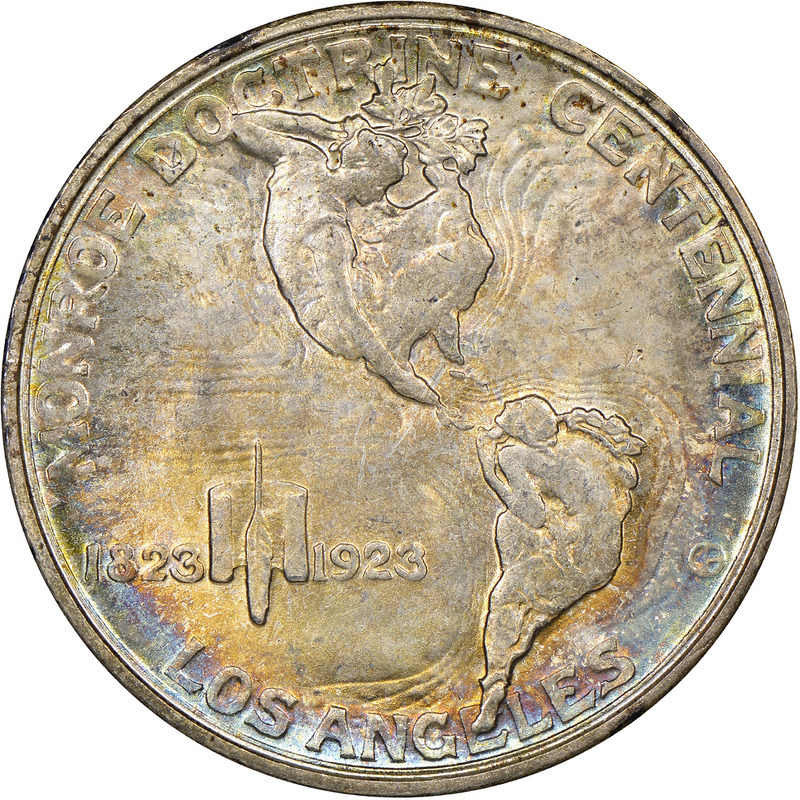 The Exposition decided that the Monroe Doctrine, written 100 years earlier in 1923, would make for a popular coin. 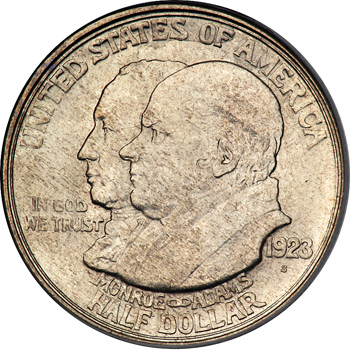 Legislation passed on January 24th, 1923 authorized the minting of no more than 300,000 Monroe Doctrine Centennial Half Dollars. Sculptor Chester Beach was selected to design the coin. 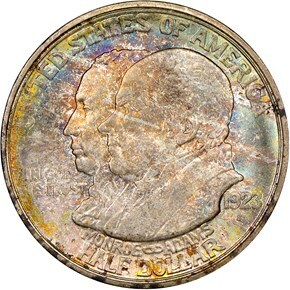 The obverse is simple enough, and shows the conjoined busts of Monroe and his Secretary of State in 1823, John Quincy Adams. Surrounding the busts at the periphery are the inscriptions UNITED STATES OF AMERICA and HALF DOLLAR. To their left is IN GOD WE TRUST, and to the right the date and mint mark. 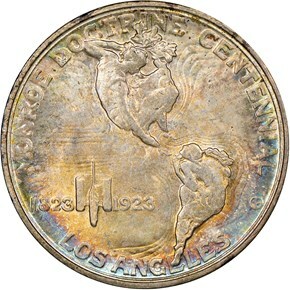 The reverse was originally to be a simple depiction of North and South America. However, in place of the relief maps of the continents, Beach substituted two female figures which were contorted into a rough approximation of the shape of each land mass. The North American figure holds a branch in her left hand in the area of northern Canada while extending a twig to South America through Central America with her right hand. The South American figure holds a cornucopia with her right arm. The major ocean currents of the Atlantic and Pacific are also included, and apparently represent the flow of goods between the two continents, unimpeded by the European powers. In the lower left reverse field the centennial dates 1823-1923 flank both sides of a scroll and quill, symbols clearly intended to suggest the Monroe Doctrine. The inscriptions MONROE DOCTRINE CENTENNIAL and LOS ANGELES encircle the border. Struck in low relief, the design overall is uninspiring. While 300,000 coins were authorized, only 274,000 were actually struck. The coins were sold for $1 each, although many were released into circulation at face value after sales fell well short of that number. Therefore, the net mintage was 274,000, and this issue is often found circulated. 8/24/2007 — David Lange concludes his retrospective on border designs throughout American coinage.